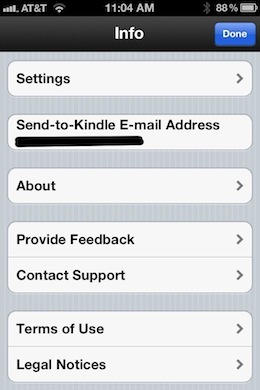 If you’ve ever used the Kindle app for iOS then you’ll know that the browsing situation has been total crap. You had to visit the online archive to download a book and it always took forever to refresh the view. Now, Kindle for iOS has received an update bringing along with it a slick new look, much faster native feel, super fast browsing of books and media stored in the cloud and more. 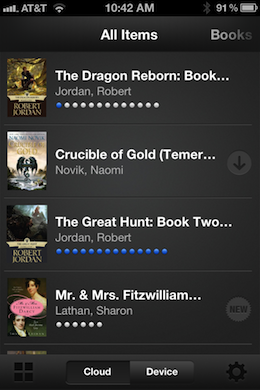 The app feels a lot faster and the new library design is great. To access your publications in Amazon’s cloud, you just tap the ‘Cloud’ button at the bottom. 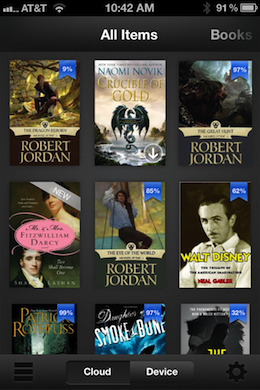 Reading percentages are now shown in both views, which is great, as you may not have downloaded a partially read item on another device. A tap on any item will download it and you can swap back to the device view with one tap of the Device button. You can look at your publications in a list or thumbnail view, which shows off the covers nicely. The settings are still unfortunately buried underneath the low-contrast gear in the tab bar, then in the nondescript ‘i’ icon, which seems silly, and the Settings panes are all standard Apple fields, not custom graphics. There is still one major feature missing from the app though: margin sizes. 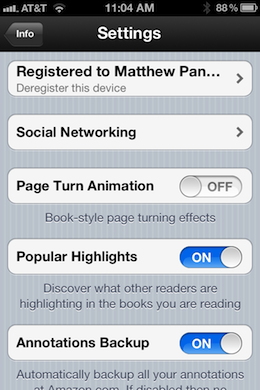 This has been a perennial issue with the app, one this reading lover would really like to see taken care of. Being beholden to one standard margin width is a bummer. Still, this is a nice update to the Kindle app for iOS and a welcome change when it comes to downloading publications and one that unifies all publications in a process that Amazon began with the update in December to access Kindle Fire publications. The interface overall feels much less like a web view stuffed into a native shell, which is good. The Android app has yet to receive an update.